No Relation has been near the top of the charts here in Canada, and all the reviews I have read have been sunny and bright. It’s a good thing I don’t have to come on here and disagree with everyone. Earnest Hemmingway was having a bad day. He lost his job, his girlfriend, and his wallet. Many people in literature have had similar bad days, but Earnest has something they don’t. A famous name. He’s tired of people making fun of his name, or not believing it is for real. To top it all off, his father has been putting pressure on him to come home and take his place as CEO of the family underwear company, Hemmingwear. All Earnest really wants is to write. He decides to take advantage of his sudden unemployment, start fresh, and work on his book. But, instead, he is faced with a bad case of writer’s block. What would it feel like to go through life with a famous name? It occurs to Earnest that he is probably not the only one, so he starts a group that call themselves the NameFamers. Everyone in the group has the same name as someone famous. This part of the book could have been over-the-top, but Terry Fallis pulls it off and I thought the members of the group became a fun part of the book. Hoping it will help Earnest to get the words flowing again, a few of his new friends encourage him to go on an Ernest Hemingway tour, stopping at all of Hemingway’s old haunts (Toronto, Paris, Spain, Key West, and Ketchum). Each of these stops result in some kind of slapstick adventure or awkward predicament for our protagonist. But will the tour work? Will Earnest get his groove back again? And, what does he decide to do about the family business? As someone who doesn’t know a lot about Ernest Hemingway, I enjoyed going along on the tour and learning a few things. I also got to know more about Arthur Conan Doyle and Sherlock Holmes. In fact, it made me want to read some Sherlock Holmes stories. If Hemingway’s writing is a competent skater crossing a frozen river, Conan Doyle’s is an elite figure skater, elaborately costumed, tossing off triple Salchows and quad toe loops along the way. Yes, both writers get you across the river, but Conan Doyle makes the journey as entertaining, significant, and rewarding as the destination. This book is light and fun, complete with happy ending. The best way I can think of describing this book is that it is like chick-lit with a male protagonist. Earnest is a pleasant, smart, polite guy who manages to get himself featured in a you-tube video that goes viral, winds up helping a complete stranger climb onto his shoulders to dump someone’s ashes into a statue’s hat, is more afraid of small dogs than raging bulls (which is quite funny), triggers his very first barroom brawl at the age of 40, and agrees to a spying expedition of the sort that you might see in an episode of Three’s Company. I can totally see this book becoming a CBC TV mini series. Terry Fallis is the author of The Best Laid Plans, The High Road, and Up and Down, which have all been well received. The Best Laid Plans (which I have read and recommend) was the winner of the Stephen Leacock Memorial Medal for Humour, as well as the CBC Canada Reads winner for 2011. And, it has been made into a CBC TV mini series. His other books have been finalists for the Stephen Leacock Medal. 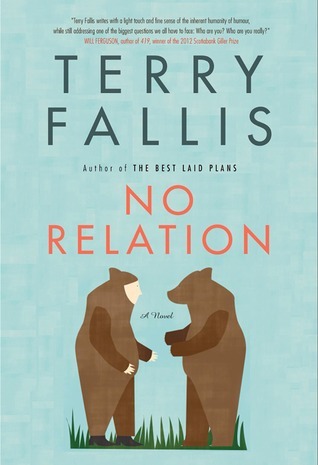 Terry Fallis has a talent for good, clean humour, and I look forward to reading more of his books. OMG if there is not a real Hemmingwear there should be! Different lines could be named after different authors and they could have quotes on them. Haha! Good idea! I think you should go for it! I laughed at Hemmingwear! And I didn’t notice the different spelling of “Earnest” until a third of the way into your post. It sounds like a funny and clever read. I wonder if there are many “chick lit” books out there with male protagonists…Good to know that this is being well received! I wondered the same thing about chick-lit. I also wondered how many are written by men. The only ones I can think of right off are all written by women and have female protagonists, but I am far from being an expert on chick-lit. No, I haven’t seen it, but I would like to so I can compare it to the novel. I haven’t seen JPod either. I agree. It really was refreshing to get a male perspective in this genre. The premise was original, too. It’s a good one to read if you want something quick and fun. I decided I need to read this when I got to “Hemingwear”! I think this would be the perfect vacation book. Writers never cease to amaze me with their imaginations and use of words. It is perfect for vacation. In fact, that is when I read it! CanLit though….Even though I’ve been proved wrong several times in recent memory I *still* have a hard time happily jumping into a Canadian book. I’m THE WORST. I will admit that your review made me think about it more seriously and next time I see it, who knows?! I may even read it! Ha! Just don’t read it if you’re in the mood for something deep or serious. Then you will be disappointed. Hmmm, not sure I would like this or not. For one thing, NOT a fan of Hemingway. Neither is the character in this book! Yeah, I always thought he sounded like a jerk. I liked his sister, too, and wanted to include her in my review somehow. Sometimes, when I write my reviews, I struggle with how much of the story to reveal, and what parts to talk about. In this case, she didn’t make the cut. Readers will just be pleasantly surprised that there is a whole secondary character that I didn’t even mention, right? This book looks like so much fun! I definitely have to check this out! How interesting and it sounds like a fun read! “Hemmingwear” had me laughing. I don’t watch out for Canadian book lists enough, so I enjoy reading your posts about the current chart toppers! Thanks, that’s nice to hear! I enjoy looking at all the delicious food you make! This was a fun book- great for light reading. Out of all of Fallis’ books this was my least favorite. In fact, I never finished it. I just feel that all of his books have more or less the same voice, and I was getting tired of it this time. It’s true that his characters seem to be similar, at least in the two books I have read. Tanya @ Write Reads said she found that with Up and Down, as well. It’s been two years since I read The Best Laid Plans, though, so it didn’t really bother me. Maybe the trick is to space them out. The stories were not at all alike. I think The Best Laid Plans had a little more meat to it, because of the politics. It was humorous, but not as light. Have you read all of them? Which was your favourite? I liked the political ones best, but maybe that’s because I read them first. I was surprised how much I liked The Best Laid Plans, actually, because I usually have little interest in politics. But, I did like that there was more to it than No Relation. I just finished The Best Laid Plans today and really enjoyed it, so I think book is next for me. Wasn’t Sherlock Holmes also in The Confabulist? I love the Sherlock Holmes stories, you should definitely give them a read. Just be aware as you are about to read No Relation that the protagonists seem similar. Other than that, the stories are very different. Interesting! Do you mean the narrators are very similar? I could see that happening. Yes, the narrator. It might bother you or it might not. It didn’t bother me, but the books were well spaced when I read them. I got to tell you that I think I hate you. I have so many books to read and now I just have to read this one. Thanks to your wonderful review. Ha! I’ll take that as a compliment. Happy reading! Thanks. Pleased to have found your blog. I look forward to reading lots more here, regards from Thom at the immortal jukebox (drop,a nickel). Hi Thom! Thanks for dropping by. Your blog looks like a lot of fun, too!